Debi is using Smore newsletters to spread the word online. "Books and Balls" SAT/ACT workshop will return to RHHS on Thursday, August 18, 6:30-8:30pm, in our east campus cafeteria. This workshop is FREE and open to ALL students. Response to the first workshop, held in March, was very positive! I encourage all students, and especially our juniors, to take advantage of this resource. 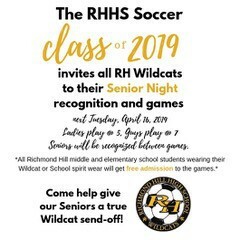 RHHS Soccer is inviting all elementary and middle school students to come out on Tuesday, April 16th, and celebrate Senior Night with our Wildcat Soccer teams. Students in WILDCAT gear or WILDCAT colors will be admitted to the games FREE of charge. Girls soccer is at 5, and Boys soccer game will follow - we will honor our seniors between the two games. 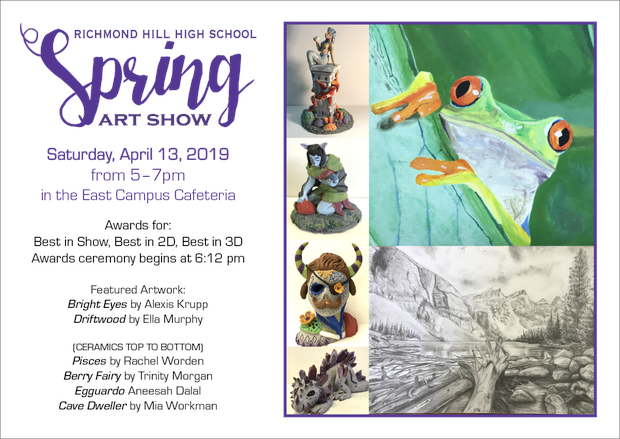 We hope you will come out and cheer on our Soccer teams and our graduating seniors. AP exams will be administered May 6 – 17 for students who previously registered. Please use the included schedule to plan ahead in case of pre-scheduled appointments. 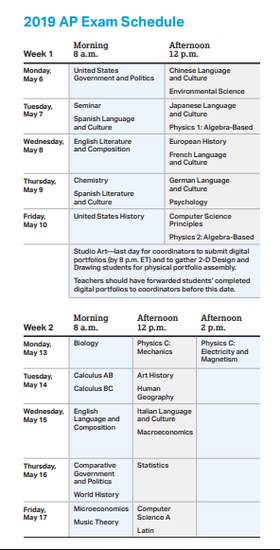 College Board sets the exam schedule and students must take their exams on the days and times indicated. If you have any questions about the exam schedule, please contact Mrs. Tanner at mtanner@bryan.k12.ga.us. Seniors - some of you have not yet picked up your cap and gown. Herff Jones will be back at RHHS on Monday April 15th at 7am in the EAST CAFETERIA for those that still need to pick up their cap and gown. If you missed purchasing a yearbook earlier in the school year, you can purchase one starting April 7th on MyPaymentsPlus.com. Yearbook cost is $88.00 and less than 100 copies are available. These are sold on a “first come first serve” basis. Deadline to purchase is May 2nd, noon or until all copies have been spoken for. Students will be allowed to pick up their yearbook on distribution day, May 7th. 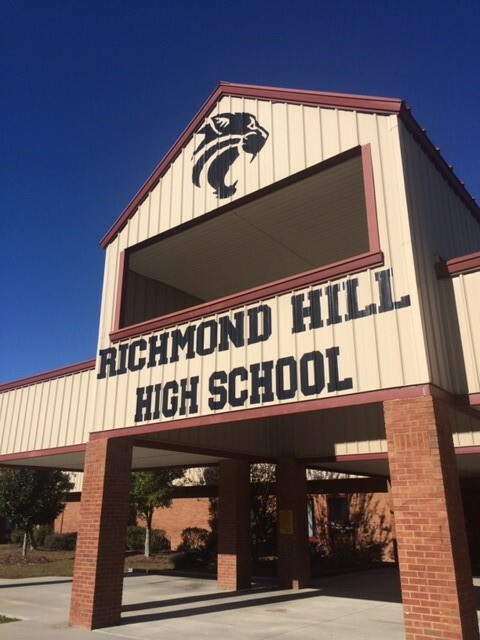 RHHS has a webpage that is devoted exclusively to scholarship opportunities. We strongly encourage students to visit this page regularly. Ms. Jenny Kea, one of our Social Studies teachers, serves as our Honor Committee chair and coordinates scholarships and maintains this webpage. If you have questions, please email her directly at jkea@bryan.k12.ga.us . The Bryan County Board of Education approved the calendars for the next two school years. 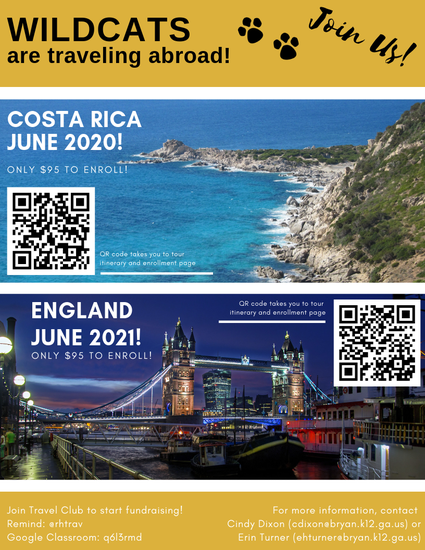 Please click HERE to view the 2019-2020 and 2020-2021 calendars. Are you moving over the summer? If your family is moving over the summer, we need this information. Please click the link below, complete this short form, and let us help you with the transition from RHHS to your child's new school. We have accumulated lots of lost items in our Lost and Found in the College and Career Center in room 602. If your child has misplaced belongings such as lunch boxes, clothing items, shoes, gym bags or glasses, please ask him or her to stop by and claim any lost items.